YaYa Chou was born and raised in Taipei, Taiwan. She earned her MFA in Experimental Animation from California Institute of the Arts and continues to live and work in Los Angeles, California. 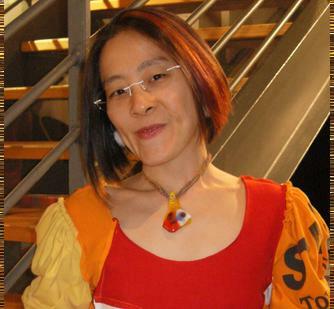 Chou is an award-winning filmmaker turned sculptor and installation artist who explores innovative uses of materials. Her work ranges from sculpture made of gummi bears, licorice lace, burnt toast, and found objects to installations with traditional media such as clay, paper, fabric, and glass. Her work reflects the cultural, biological diversity and raw nature of humanity and life. She is inspired by the living conditions, social phenomena and behaviors of organisms. Supported by science, eastern philosophy and literature, she investigates how lives are lived. She has exhibited in solo shows, most recently at: Sharjah Calligraphy Biennial, Sharjah Art Museum, United Arab Emirates in 2014; den contemporary art, West Hollywood, California in 2011; Central School Project, Bisbee, Arizona in 2011; Fort Wayne Museum of Art, Fort Wayne, Indiana in 2010; Indie Collective Gallery, Culver City, California in 2010; and LAAA/Gallery 825, Los Angeles, California in 2009. Selected group exhibitions include shows at: the Museum of the Shenandoah Valley, Winchester, Virginia in 2014; Village Theatre Art Gallery, Danville, California in 2013; George Billis Gallery, Culver City, California in 2013; Palm Springs Art Museum, Palm Springs, California in 2012; San Luis Obispo Museum of Art, and the San Luis Obispo, California in 2011. Her award winning animated films have been screened in numerous international film festivals. Chou is the recipient of two “Artist Resource for Completion” (ARC) Grants from the Durfee Foundation, as well as a Downtown Los Angeles Artists’ Grant. She was in residency at the Central School Project in Bisbee, Arizona in 2001.